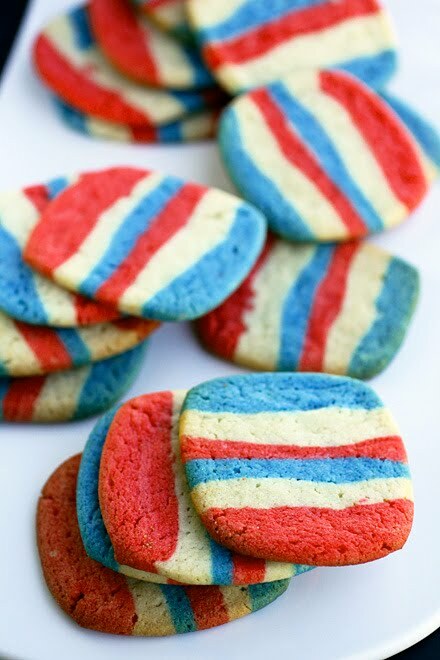 I know I say this frequently, but these are my new favorite cookies and not just because they’re red, white and blue! I love how each layer has a different flavor but go so well together. And don’t they look like I slaved over them? No such thing happened. The dough went together in a few short minutes. Think old Rice Krispie Treat commercials where mom pats flour on her face before carrying out a tray of treats, sighing as if she’s spent all her energy baking. That’s exactly how these cookies are. Of course being red, white and blue might just be my real favorite part. The instructions look long, but it's just details in case you need them. 1. Line an 8x4-inch loaf pan with waxed paper, extending paper over sides of pan. 2. In a stand mixer beat butter and eggs together. 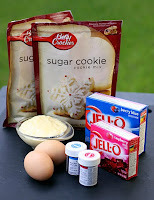 Add the sugar cookie mixes and beat until just combined. 3. Divide the dough into three equal parts and place in bowls. Set one part aside. 4. Add raspberry Jell-O and red dye for color (You’ll need quite a bit or they’ll be pink) to one part. Knead with your hands in the bowl until the Jell-O is mixed in then pick the dough up and finished kneading folding the dough over with your hands until combined. Repeat with berry blue Jell-O and blue dye. 5. Divide the doughs in half again to make 6 layers. Pat a red dough into the wax paper lined pan. Press gently with the back of a dry measuring cup to even out the dough. Next, pat a plain dough between your hands to form nearly the size of the pan. Press the plain dou gh into the pan over the red layer. Repeat with blue, red, white and blue. 6. Fold the wax paper over the cookie dough and cover with foil. Refrigerate for several hours until firm. 7. Line cookie sheets with parchment paper. Preheat the oven to 375 degrees. 8. Once chilled, dump the dough out into a cutting surface. 9. Remove dough from pan and trim edges. Cut log into ¼” thick slices. Then cut slic es in half to form squares. 10. Place cookies on sheets 1 1/2 inches apart. Freeze sheets for 10 minutes to retain shapes if desired. 11. Bake 8-10 minutes or until cookies are no longer wet looking and are very lightly golden on the sides. 12. Let cookies firm up on the cookie sheets for a couple of minutes then move to a cooling rack. Recipe & photographs by Laura Flowers. I know my son would love these cookie as I do! I miss seeing those commercials. LOL! I love that there's actually a different flavor in each layer! So many times when you see colored layers, that is actually the case! Laura, these are visually stunning! What a fun idea for the fourth of July. Thanks for sharing. Yum! They look delicious!! I think I may try them with my homemade sugar cookie recipe. I can't wait to try them. these are to cute. they will def be on my 4th of July table. Laura, I love the looks and simplicity of these cookies! I am printing this recipe out pronto! THANKS! Hi Everyone! Thanks. I had so much fun making these. I hope you do too. @ Jen homemade cookie dough is a great idea. Those are some seriously genius cookies. I love your blog, too! These are so cute. I love all of the colours. Wow, what an awesome idea! Love all the different colors and flavors. Great idea! Can't wait to make them with my daughter! These are so easy Carol. I think I'll make another batch and throw them in the freezer for the 4th. Very nice Laura! I have some sugar cookie mix i need to use up. Perfect for this recipe. Thanks for the idea. Love the colors! But then I'm biased as I really enjoy not only the food you post but the photo's are amazing. Thanks for another beautiful post! I just finished making these cookies. All I can say is YUMMY!!!!!!!!!!!!! Jaclyn thank-you so much for leaving a comment! I think you're the 1st person to make these! You are very welcome. They were great. I took them to my brother's 30th birthday party and everyone enjoyed them. I can not wait to try some more of your recipes!!! I will be making these tonight! I'm so excited. I'll let you know how they turned out! Love, love, love this cookie! Can't wait to share them with friends. I made the cookies. I really felt like I was playing with Play Doh while working in the colors. Crystal I am so happy you like these and had fun with them! Thank-you for trusting me and making them. Yay! So fun and so easy! My kiddos and I just made them and they're in the oven for our 4th of July family dinner tonight. Thanks! these cookies sound so good and look good too. I look forward to making them. I featured them on my blog today. I am making these today!! I cant wait to see how they turn out!! Thanks for the great recipe!